On May 8, 2015, Abbie and Malik Naber tied the knot—and also closed on their first home in Cardiff-by-the-Sea together. Then Abbie, a former fashion designer and dancer (and The Amazing Race competitor on season 21) drew up plans and worked with contractor—and family friend—Rusty Johnson of Rusty Johnson Construction to transform their new home while the pair honeymooned in Peru and Costa Rica for two weeks (though construction wasn’t completed until the end of August). Plans included changing the entry and creating more of a hallway so visitors didn’t walk immediately into the kitchen; relocating a water heater to the attic to enlarge the master bathroom and closets in the master bedroom; and removing a wall in the kitchen to create an open floor plan, as well as renovating the two bathrooms and kitchen; and replacing all doors, baseboards, floors, windows, wiring and plumbing. The couple opted to keep a wood-paneled wall in the main living space “that had a fun retro feel,” Abbie says. And they left the pergola in the backyard standing but painted it black and added corrugated metal along one side to give it a more modern feel. To create more depth in the white kitchen, where the family spends a lot of time, Abbie opted for a pillowy, textured tile backsplash instead of marble. 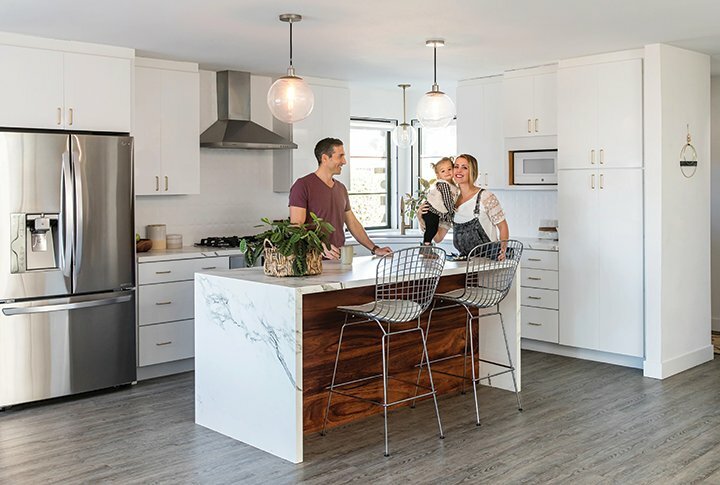 Two years after the Nabers bought their home—and eight months after Abbie gave birth to their daughter, Wyatt, now 18 months—they embarked on renovation No. 2 with Rusty. “We love to entertain, and the house we had was great for that, but Thanksgiving dinners and Fourth of July suppers were definitely outdoor events,” Abbie says. For remodel, part deux, the couple busted through that original wood paneled wall and took down the pergola to create a large indoor-outdoor dining room and bar space with lots of built-in storage. They vaulted the ceiling in the center of the new dining room one foot, painted it black and ran beams across it with exposed black brackets. They also turned a door from the kitchen to the backyard into a window and created a breakfast nook. “This renovation was a bit more challenging,” Abbie reveals. For one, it happened over the summer. With the back of the house covered in plastic, it meant no ventilation. Plus, Abbie was attempting to sleep train her infant and adhere to naps and schedules. But they got through it, and by Labor Day, the modern dining room was complete. “It’s my favorite area,” she says. “It’s an open, airy room that not only adds space, but adds comfort and gives us a place to hang out with family.” Mixing woods in this space was out of Malik’s comfort zone, but Abbie told him to trust her, and he did. The pair have always made decorating a team effort. When they started furnishing this home, Abbie and Malik wanted to rid themselves of the hand-me-down furniture, college leftovers and bachelor-pad acquisitions, and start fresh. 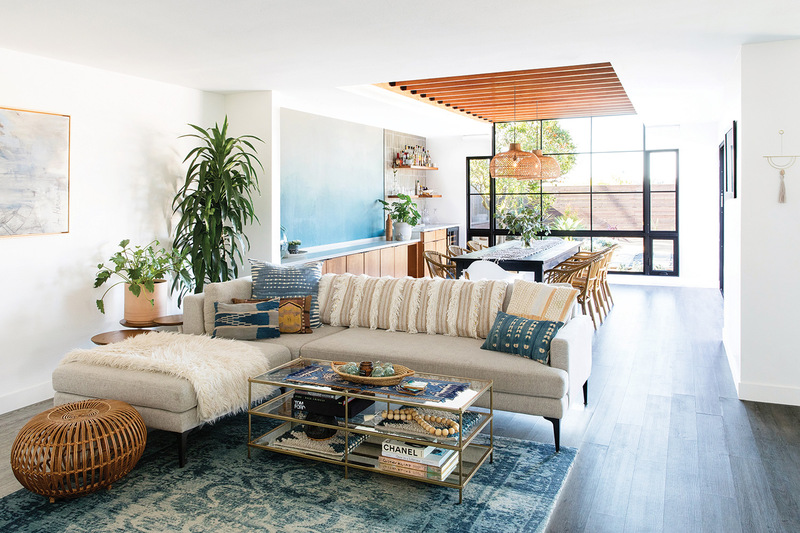 The living room perfectly mixes new with old, high with low, and pieces collected from travels with flea-market finds. Plus, layers of Abbie’s pillows and textiles keep things cozy. Abbie repurposed the lacy embroidery hoops from her wedding as decor in her home office. Prime example: the lighting in the dining room. “I wanted woven fixtures; Malik wanted to make sure the weave was large enough to still see the view we’d just spent money on,” Abbie explains. So she searched, and searched, and searched until she found the perfect pendants from a company in Spain. They also worked together to find the ideal console/sideboard to turn into a vanity for their master bathroom. “She found lots of options, but drawers weren’t deep enough to accommodate all the necessary plumbing,” Malik says. Abbie discovered the winning item in an Etsy shop in Florida so it was put on a truck and sent west. Abbie kept Wyatt’s room intentionally neutral and stylish enough to grow with her. But when it comes to making statements in a room, Malik leaves it up to Abbie’s visual talents. 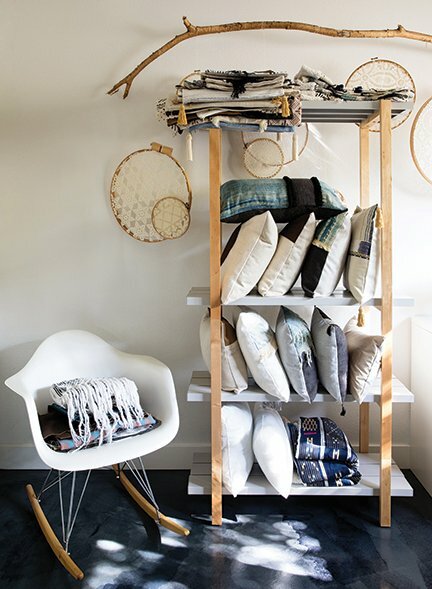 The textile designer (she has an online shop that sells luxe baby blankets and pillows she creates using vintage fabrics) says she prefers wallpaper over paint to add texture, depth and personality in a room. 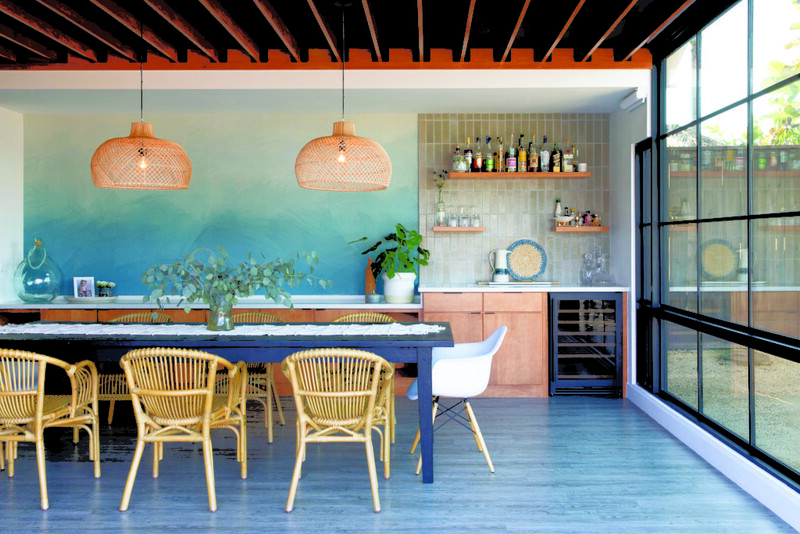 In the dining room, she picked a blue tonal wallcovering that “reminds me of the ocean,” she says. 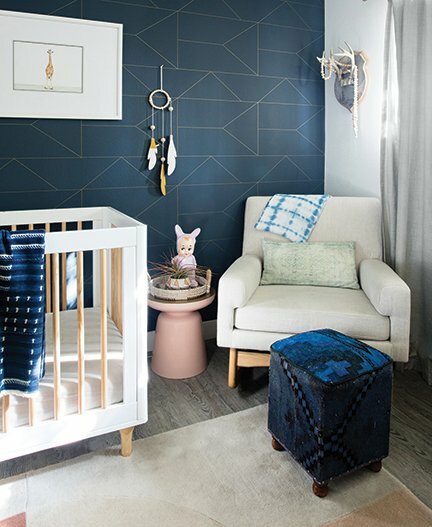 In her office, she opted for a neutral, textured paper with stripes that mimic crocodile skin, and in Wyatt’s nursery, she hung a gender-neutral geometric paper that will easily grow with her tot. Another place Abbie likes to pack a design punch? Under foot. 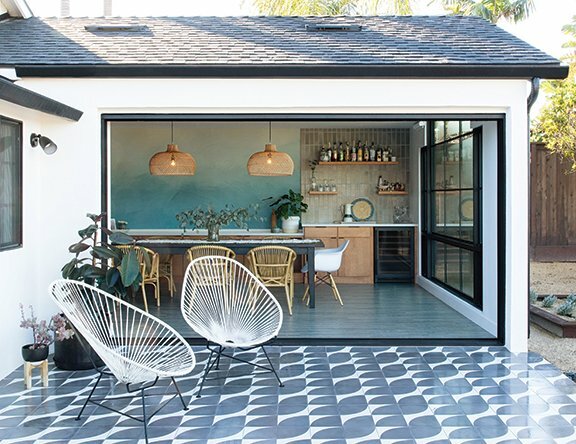 “Tile can define and personify a space,” she says. Abbie used various graphic patterns in her entryway (outside the front door), on the back patio and in both bathrooms. “When I find a tile I can’t live without, I splurge and use it in a smaller space. Then I make more budget-friendly decisions elsewhere,” she explains. In the tiny guest bath, for instance, pricey floor tiles were paired with cabinetry from Ikea.